‘Baxter Patentee’ is often seen on needle-box prints produced by George Baxter (1804-1867), a Victorian entrepreneur who recognised that sewing machine manufacturers might like to spruce up the large quantities of needle boxes produced for their machines. At the time, sewing was a way of life for many women, and it was customary for ladies to purchase needles in small boxes, containing various sizes. And in the Victorian era, these needle cases could be found in wood, bone, sterling silver, pewter or other materials. Industrialisation and the rise of the middle class created a market for less expensive and more practical needle boxes and, around 1850, master printer Baxter began producing pictures to adorn and enhance the covers of the boxes. He also began issuing them in sets, some of which he mounted for sale. They became known as ‘needle-box prints’ and generally showed historical or topographical scenes. Often of outstanding quality, many Baxter prints were ‘saved’ by discreet scissor cuts long after the needle boxes had been emptied. The survivors were often mounted and framed for decoration. 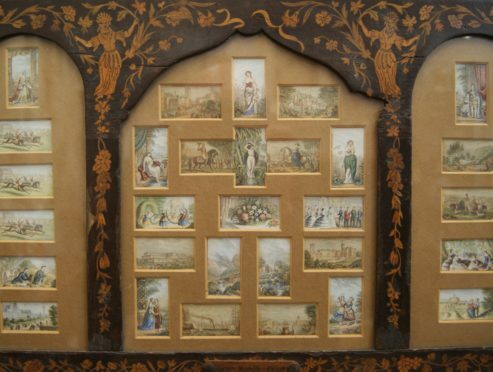 This brings me to Capital Antiques at the Abernyte Antique & Arts Centre and a collection of Baxter needle-box prints housed in a delightfully over-the-top marquetry frame that comfortably predates its contents. The 30 needle-box prints of the Abernyte panel – an unusually large number – include a range of scenes. A mounted Wellington-type figure doffs his cap, men-o’-war are shown in a busy harbour, there’s a royal marriage and several Continental and classical scenes. A view of the 1851 Great Exhibition at Crystal Palace usefully offers a clue as to the age of the collection. A reminder of bygone days, the Capital Antiques panel is priced at £275. Needle-box prints in a marquetry frame, £275 (Capital Antiques, Abernyte).